Contrary to what our photos may suggest, not all our time is spent spying on birds and plants at Finches Gully. 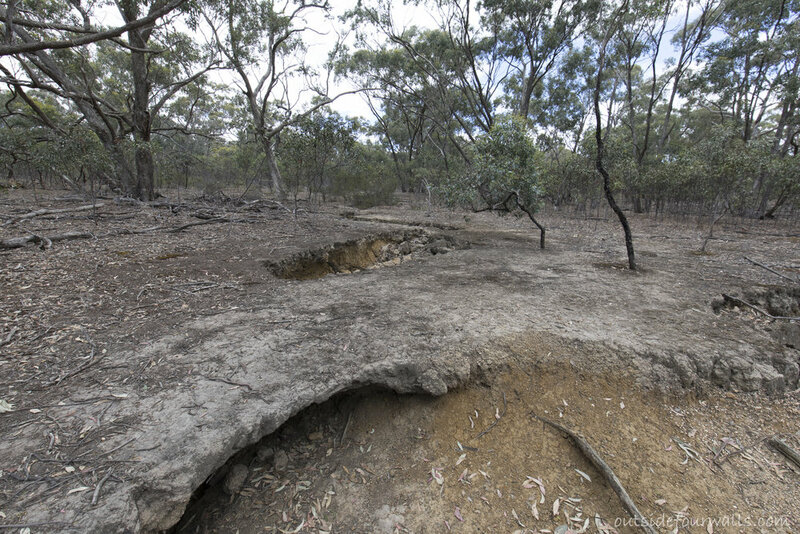 Sometimes we wander around in dismay, noticing that a new area of gully erosion has appeared, or a few small erosion tunnels have collapsed and joined to form one big one! However, it’s fairly common in the area and thanks to historical land uses (and some still current), it can be tricky to fix. In the mid 1800’s land use in Clunes and the surrounding area was focused on grazing, cropping and gold mining. Government at the time was encouraging new settlers to clear their allotments with little concern for long term effects. Fast forward to a 2015 class where I was studying soils as part of my Diploma of Conservation and Land Management at TAFE. I must admit, I didn’t find it the most interesting topic and this was compounded by an extremely dull teacher who, I believe, had lost the will to live let alone teach. However, one thing woke me up really quickly. I’d brought in a soil sample from Finches Gully and was doing all the usual tests. One involved putting a drop of water on a little pile of my precious soil to see how long it took for the water to be absorbed by the soil. Five minutes later and my classmates had moved on to the next test but my soil was determinedly resisting to soak up any water. Another ten minutes and still nothing. It was scary but a little impressive too! Now I could understand why rain formed sheets of water that ran over the ground, scouring it and removing the top soil. These sheets of water formed rills, gullies and tunnels, which quite efficiently transported our soil downstream, depositing it as sediment in the nearest waterway. The photo below shows the path that water is following over the landscape. 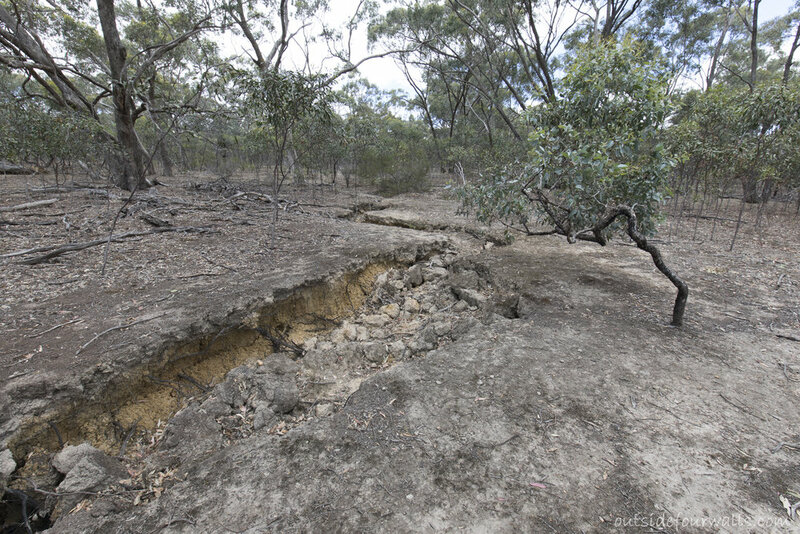 We've got the trifecta of sheet, gully and tunnel erosion at Finches Gully! The situation is further exacerbated by rabbits who take advantage of tunnel erosion and start digging extensions, helping to the link up the tunnels. Incidentally, one of our trail cameras captured footage of rabbits using an area of tunnel erosion, then a fox going in after them! Having water repellent soil is obviously not great. Apart from water not easily infiltrating the soil, the impermeable crust that forms makes it hard for seeds to penetrate the ground and establish roots. 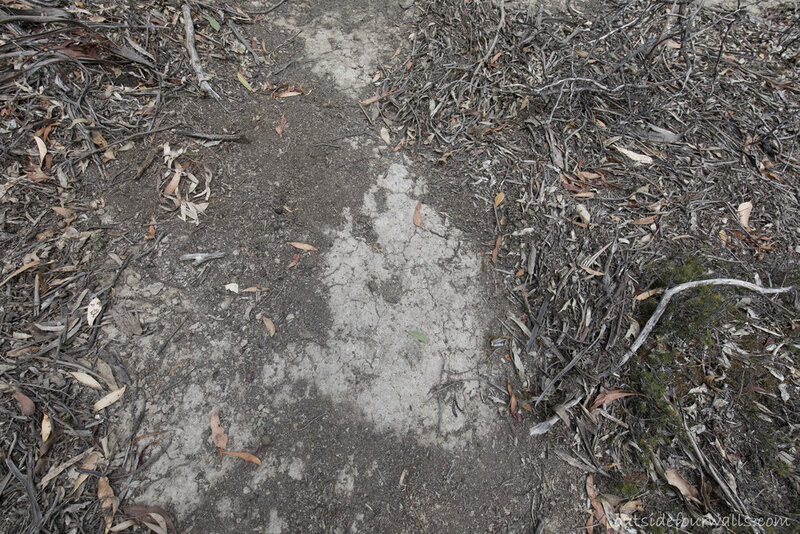 The photo, below left, shows a healthy ground covering of leaf litter, moss and branches. 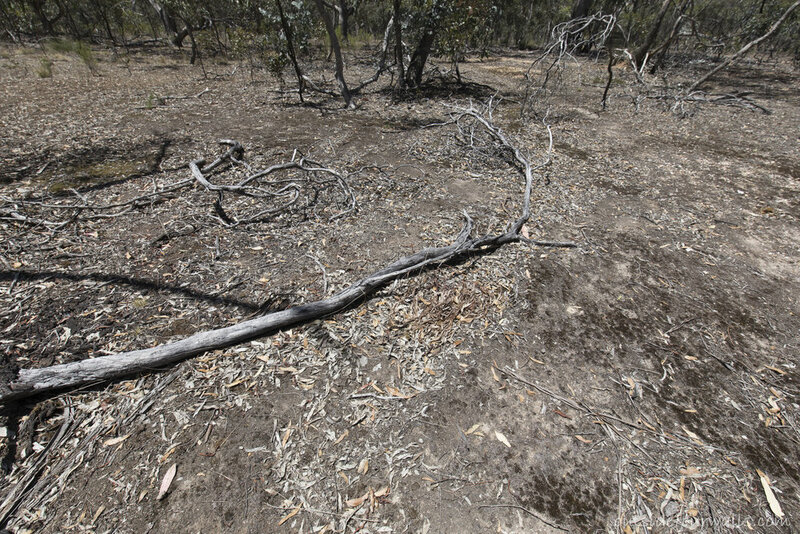 The photo, below right, shows an area where water has scoured the ground to a hard, exposed crust. Nothing grows in these areas. It was clear that areas with a solid covering of leaf litter, branches and logs were less prone to erosion and had more natural regeneration. Our approach so far has been to drag branches across active water scouring areas in an attempt to slow the path of water, allowing leaf litter, soil particles and seeds to build up. In some places this has worked really well, but in other places the amount of water is too great and we have some rather grand tunnels forming! Our next plan of attack is to stake some coir logs (densely packed coconut fibre rolls) in a staggered arrangement across the flow of water. Unfortunately these areas are quite close to the boundary of our neighbour’s property, so we can only work back as far as our fence allows. It will be interesting to see what difference this makes, so stay tuned for an update this time next year. Feel free to share any tips with us, regardless if they resulted in success or failure, any advice will be welcomed! Photography of Australian flora and fauna by Michael Gooch and Louise Nicholas. Get ready for plenty of birds, plants, insects and landscapes! All photography, video and music by Louise Nicholas and Michael Gooch unless otherwise credited.